The admissions process is intimidating—it just is. Taking the OAT, submitting your application, and preparing to interview are all just plain nerve-wracking. How do you get your brain wrapped around the process? How do you strategize for smooth sailing through this bumpy ride? Better yet, can you turn this bumpy ride into a smooth one—one you may actually enjoy? 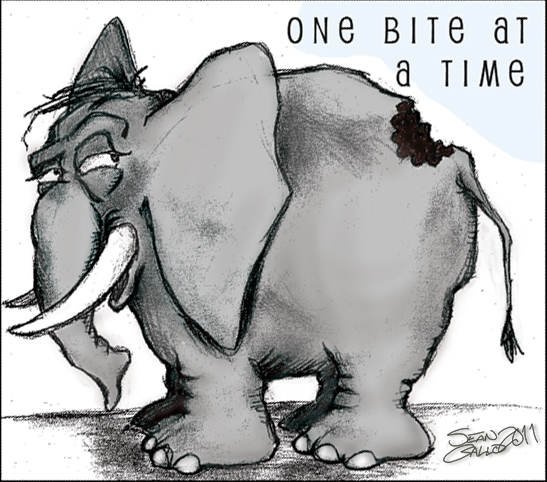 An optometry school applicant is forced to eat an elephant—strategizing for a successful admissions outcome is a huge undertaking. I’ll bet that nobody within your circle of family and friends truly understands the magnitude of the task you’ve chosen to undertake. They have no idea what’s involved in the challenging course load, preparing for and taking the OAT, shadowing, and submitting your application with its various elements that have to be meticulously reviewed before submission. They can’t possibly understand how important it is to be well-prepared for the interview: getting your personal statements articulated, deciding on what to wear, dealing with jangled nerves on the day-of, and so many other intangibles involved in every part of the process. It’s you alone, dear pre-optometry student, who is faced with eating the elephant. To be successful, you’ve got to come up with an elephant-eating plan and stick to it—a plan that specifies exactly what your elephant-eating quota is for each day. To be effective, your daily plan must have positive and negative reinforcement. If you stick to your plan and get your bite-of-elephant eaten on schedule, there should be a reward, and if you fail, negative consequences should result. I listen to a DVD series from Great Courses, an educational resource. In one of the lessons discussing desirable habits for success with writing goals, Professor Dorsey Armstrong explains how she eats her daily portion of elephant. As part of her job, she is routinely required to write articles and papers. She has developed a method to motivate her and facilitate this process. At the start of each project, she pledges to write for two hours each day. Using her desk as her workstation, each day she begins by making an entry on a time card by noting the time she starts. If she is interrupted for any reason, she clocks herself out and makes a notation of the minutes she devoted to that session. When she completes her objective for the day, she is free. This system worked so well, she started tweaking it to work better: if she was on-a-roll at the 2 hour time-mark, she would continue and give herself a time-credit to apply towards the next writing session. Pretty soon, she was doing 2-3 more hours of writing at each session which would give her the rest of the week off. As a result of this system, she was honoring her elephant-eating commitment and generating care-free time-off to boot! She reported that her husband, also a professor, would know when she was working on a writing project—he would find little pieces of paper with time intervals and net minutes written on them scattered all over the house. You can imagine how relieved and giddy she must feel after she eats her elephant quota ahead of schedule, affording her mental freedom to fully enjoy her well-earned free time. This system keeps her on-track to finish assignments on-schedule while maintaining her peace of mind through the entire process. Another byproduct of this discipline is if you stick to your schedule, when and if it comes time to deal with disappointment due to a negative outcome, you can take it in stride. If you do fail to reach your goal, it wasn’t because you didn’t execute the plan and eat your daily bite of elephant. You don’t lose confidence in yourself—confidence you will need to regroup and try again. Elephant bites get less and less appetizing as they pile up. If you let too many days go by, those elephant bites will start kicking up a stink and one day, with no warning, you’ll cross over a threshold—it will become impossible to achieve your goal. Why aren’t you getting your daily portion of elephant eaten? Is it because you aren’t smart enough? I doubt it. It is more likely a matter of scheduling and more effective time-management. “PRIDE” is Mr. Sullivan’s acronym to explain his process: Personal Responsibility for Individual Daily Effort, a philosophy that takes its wisdom from the elephant-eating methodology. Farley is a Disneyland entertainer who plays on the steps in Frontierland. Each time I show up, he hands me his fiddle and gives me a lesson. I am learning to play the fiddle. From the noise I make that is almost unbearable, I’ve learned there is a reason why violin lessons should be taken when one is a little kid! For the first 6 months, nobody would even listen to me. My daughter came to visit one weekend and she hid my fiddle bow so that a fiddle demonstration would not be a possibility. I was discouraged. Looking back, if I had judged my progress and decided whether or not I should continue this torturous fiddle-lesson process based solely on my fiddle competence at any one stage of the process, I would have quit with no regrets. I needed a plan to proceed. I decided to apply “PRIDE.” I stopped evaluating my day-to-day progress and instead, only focused on completing a solid daily practice session. That was my only task—to devote myself to a regular practice session and to pass no judgment on the outcome. It was hard ignoring all the nerve wracking sounds coming from my fiddle practicing, but I persevered. With encouragement from my patient fiddle teacher and 8 months of practice, amazingly enough, I started to sound almost bearable! What a miracle! I finally got the JND (just noticeable difference) I was longing for! Even my daughter has upgraded me to “tolerable” which is quite a compliment coming from her, my harshest critic. 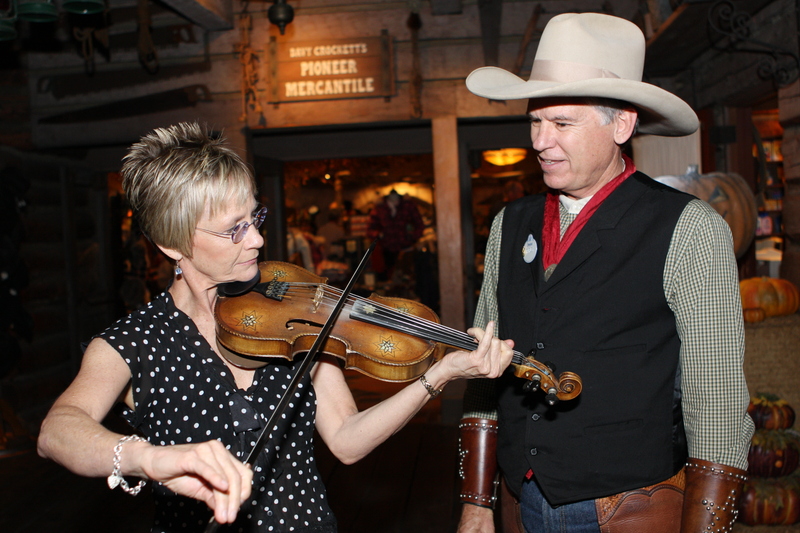 Disneyland’s Billy Hill and the Hillbillies encourage me to keep up my fiddle lessons. 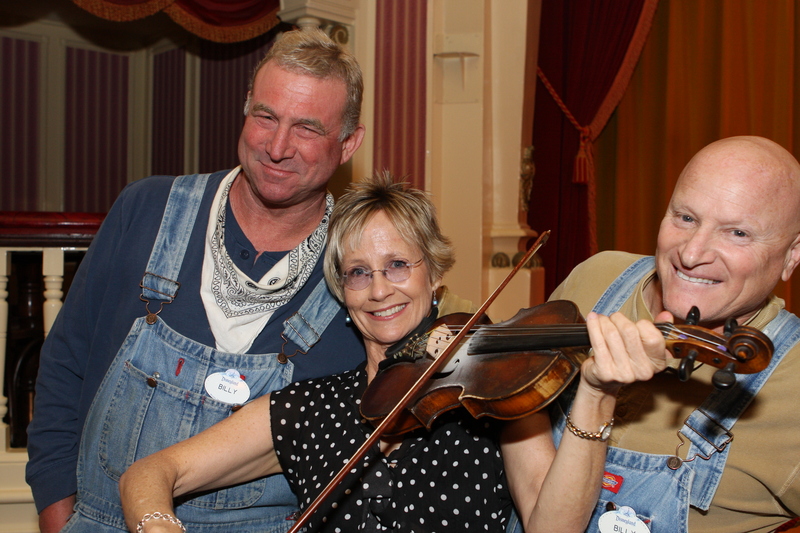 Here we are after a show at the Golden Horseshoe. I kinda look like I know what I am doing…ha! It all boils down to this: put in a regular portion of dedication to your goal. Your goal is to be an optometrist. If you use PRIDE to help you eat that daily bite of elephant, you’ll see that goal materialize. That’s your only job—to have Personal Responsibility for Individual Daily Effort and eat that small, manageable, elephant bite each day! That’s all anyone of us can do. Do it each day and you’ll have a renewed confidence in yourself—you’ll turn this bumpy-ride of getting into optometry school into a smooth and enjoyable one. Hey, anyone want to hear a fiddle solo? …I didn’t think so…!